The UK's Alex Goulder capped off an impressive 2014 at the felt with an outright win in this year's partypoker WPT Prague Main Event. 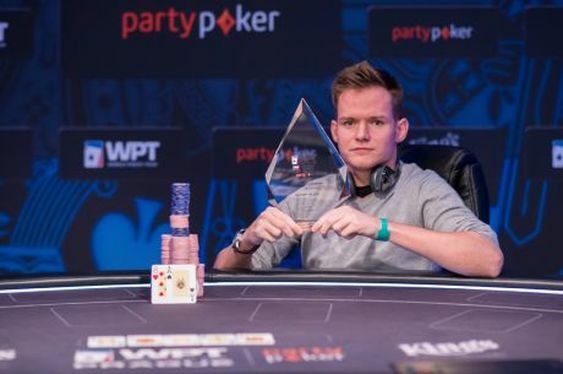 The young MTT pro has gone deep in a number of events in the last few months, but on Sunday night he captured his first WPT title after defeating Niclas Adolfsson heads-up. Yesterday's session started with Goulder sitting in seventh place and just 19 players left fighting for the €105,000 top prize. However, by the time just eight players were left in the event, Goulder had snatched the chip lead ahead of such luminaries as Simeon Naydenov, Chris Hunichen and Sebastian Langrock. It took threes hours of action for Chris Hunichen to become the first casualty of the final table. Despite Hunichen's pocket sevens having more of a chance to win than they normally would against pocket aces (both Goulder and Niclas Adolfsson held aces), the 6s Kh 8h Ks Td board wasn't enough to save him. With one player down and the elimination floodgates now open it was time for Goulder to make his move towards the title. Indeed, as Lakhov, Naydenov, Zo Karim and Andy Seth all fell by the wayside, Goulder was able to carry a significant chip lead into the final battle with Adolfsson. Although Adolfsson was able to claim the chip lead midway through the battle, Goulder rallied late in the match and eventually sealed the deal when his As 8h held onto its lead against Adolfsson's Kh Th. With the final pot cleared from the table and the confetti bomb activated, a jubilant Goulder was left to pose for pictures with his first WPT trophy and a cheque for €105,000.